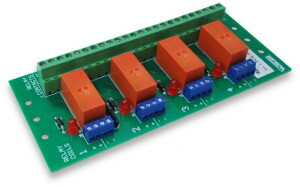 This relay board provides a convenient way to add relays to your project by allowing the connections to the coils and contacts to be wired with screw terminals. No soldering is required. This board includes four DPDT relays with convenient screw terminal connections and includes LED's which indicate when each relay coil is energized. In addition, a protection diode is installed across the coil of each relay in order to suppress the inductive spikes which occur when relay coils are de-energized. The relay contacts are electrically isolated from the rest of the board, which allows the load circuits to be electrically isolated from the control circuits. This board does not include any relay driver circuitry, but instead has direct screw terminal connections to the coils and contacts of the relays. For a similar board with built-in driver circuitry and SPDT contacts, please see the RLY104 Relay Board. Relays allow high-current loads to be switched with a low-current control signal. The control signal energizes an electromagnetic coil which mechanically closes a set of electrical contacts. The contacts are electrically isolated from the coil, allowing a low-voltage, low-current control signal to control a high-voltage, high-current load. 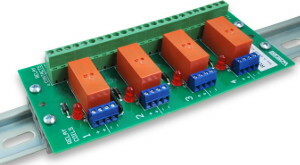 These relays can be used to switch both AC and DC loads in a variety of applications. These products are available in two different mounting variants. Product numbers ending with -DIN come with DIN clips already installed and ready to snap onto 35mm or 32mm DIN rail. Product numbers ending with -FT have stick-on rubber feet installed on the bottom side, allowing for benchtop use or panel mounting. For panel mounting, we suggest 1/4" nylon standoffs under the mounting holes, and #6 screws. Approximate dimensions: 2.6" x 5.9"
All of the above items are normally stocked. Please call us if you need to verify availability for a specific quantity, or for pricing at higher quantities. Please visit our ordering page for our ordering policies and a list of ordering methods.